Wowser. 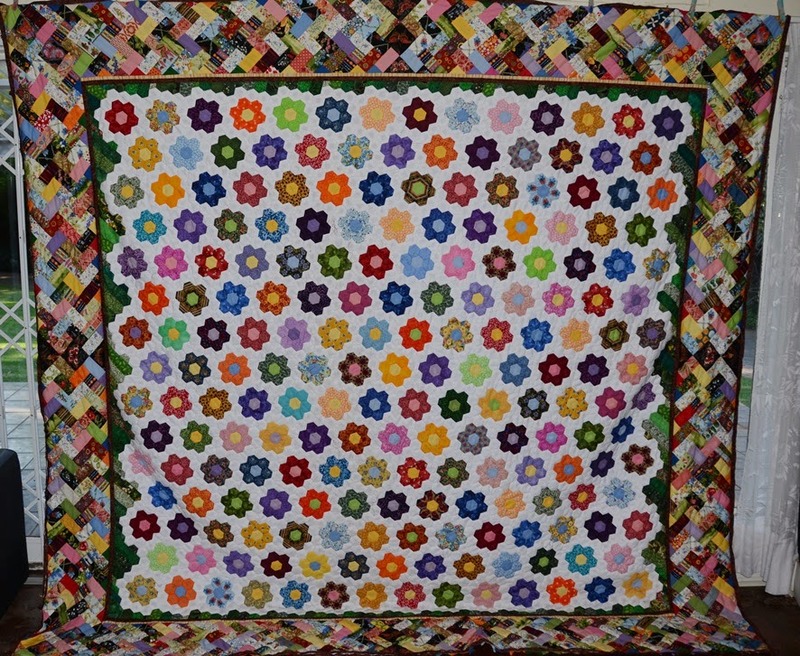 I have just finished stitching the top to my Granny's Garden quilt. I started the first flower on the 22nd of June 2014 and the final flower was done on the 1st of December 2014. The border took me from the 1st of December until the 22nd of March 2015. It has taken me a week to sew the border onto the quilt. So from start to finish it has taken me 280 days. The whole reason for wanting to do a granny's garden quilt apart from the fact that they are bright and friendly was to use up a whole lot of jelly rolls that I have collected over time. Many of them were presents and a gorgeous collection of colours. I think they have melded together quite well. 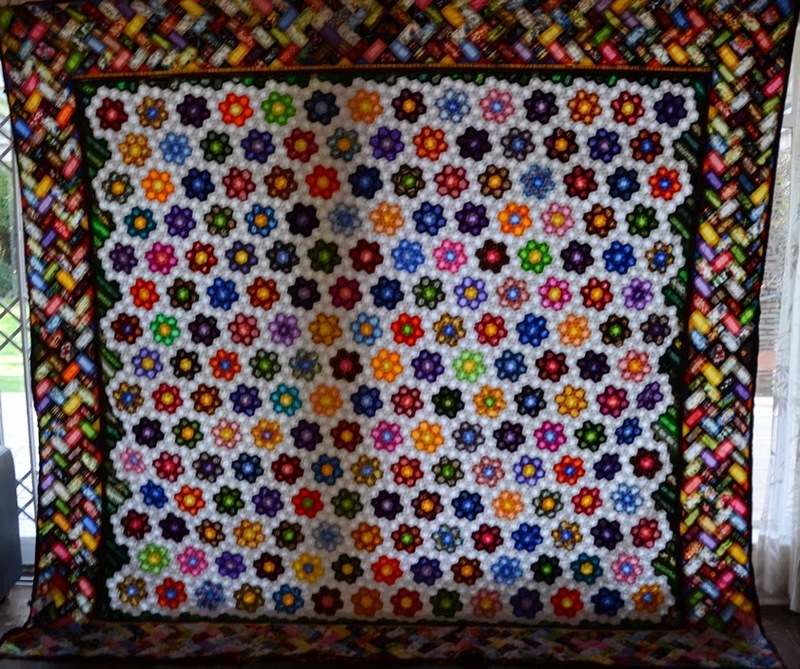 As you can see with the border, I just made 4 cm by 8 cm blocks and plaited them together. I still have about 6 more jelly rolls, so I will have to think of another quilt to use them up on. The next step will be to create a backing. 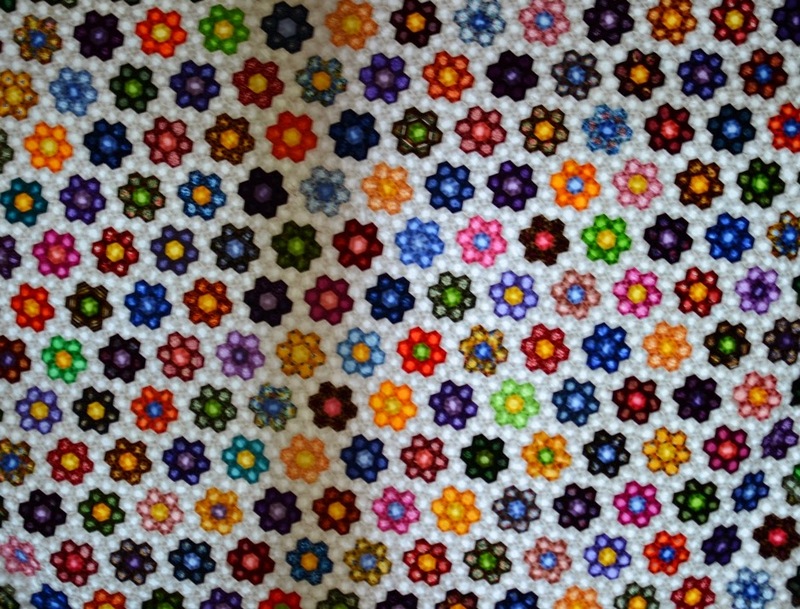 I have some lovely floral fabric, which should be perfect. The only problem is that they are not as wide enough to be a backing without some creative intervention. I am going to be using a silk batting. This will be an new experience. The batting feels lovely, but, I will only know how it stitches later. I loved the feeling of bamboo batting, but found that it was quite 'sticky' on the needles. Hope you are all having a marvelous day and getting some stitching in. Love the double braid border. 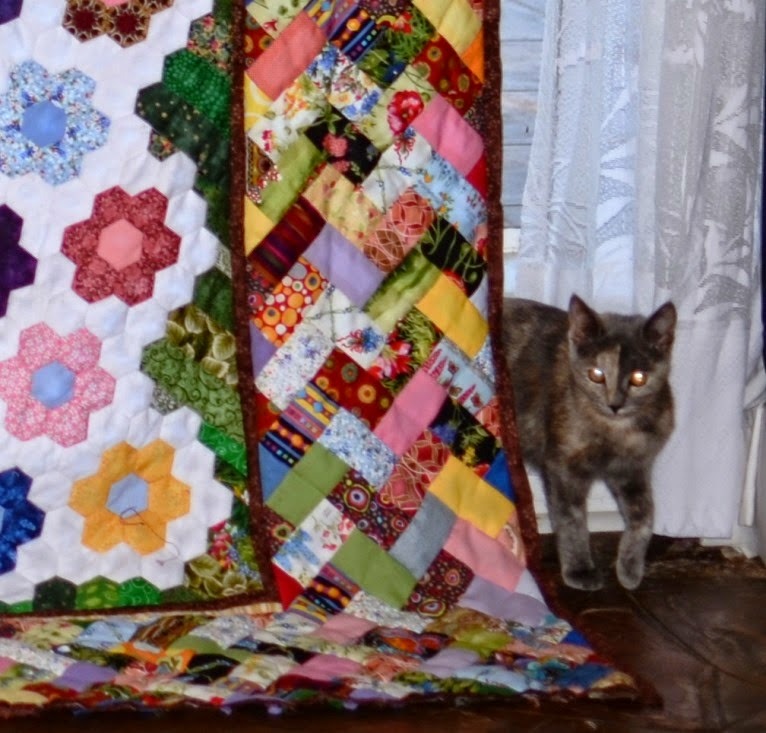 The scrappiness in the border compliment the flower garden in the main body of the quilt. A wonderful quilt! Thanks. It took a lot of pondering to decide what to do for a border. I like the scrappiness of the braid as well. What a wondeeful piece of art. It is amazing. Did you machine or hand piece the border? Hi Dagmar, I hand stitch all my tops. I like the feel of hand stitching. I also hand quilt all of my quilts. I have machine stitched a few quilt tops, but, I do prefer doing the stitching by hand. I find it slow and relaxing. I am not a very patient person by nature, so I find the quietness of hand stitching very relaxing.